Why struggle with a slow internet connection when the Tooway™ signals are at your home right now with 20Mbps broadband ? Tooway™ uses satellite technology not phone lines. That means that whether you live remotely or are just unlucky in that your connection is poor, we can immediately deliver fast, reliable and affordable broadband to your home right now. Traditional "wired" internet services connect you to the internet using copper phone lines, or if you are really very lucky, fibre optic cables. This works well if you live near an exchange, but less so if you live more remotely or even if the cables between you and your exchange take a tortuous route. Tooway™ uses satellites. 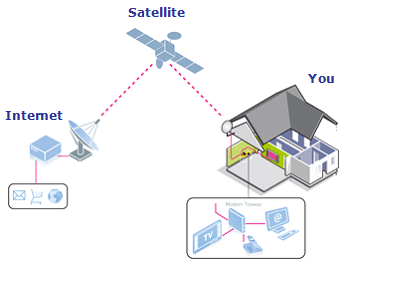 A small dish on your building allows the signal to be bounced from your computer, off a satellite and connect with the internet. Because Tooway™ is a two-way system, the same happens sending data back in the opposite direction. Click below to go to our Tooway suppliers website (Bentley Walker) to order the package and price to suit you. The prices Eurosky are able to offer are £5.49 per month cheaper than if you went to Tooway directly, thanks to our partnership with Bentley-walker, saving you over £65. When you get to section '5. Pick installation option' select Customer Arranged to save up to £50 by purchasing your installation directly from Eurosky at the bottom of this page. Unless you are buying a 'Self install kit' you will need to purchase an installation package. PLEASE NOTE, WE ARE ONLY ABLE TO OFFER THIS INSTALLATION DISCOUNT IN THE CF, NP, SA & LD POSTCODE AREAS, IF YOU ARE UNSURE IF YOU CAN USE THIS OFFER OF REDUCED DISCOUNT, PLEASE CONTACT US FIRST Outside of these postcode areas, please use the installation options via the Bentley Walker page, you will still benefit from reduced monthly subscription, and can still use the £20 discount code below. When you get to section '6. Promotional Codes' enter UK40E50 to save £20 as a Eurosky customer. With Tooway Ka-band, satellite internet has really come of age. This is a reasonably discreet, eminently affordable package that delivers broadband at better than most ADSL speeds with consummate reliability. Of course, if you have a digital phone exchange just down the road you’ll stick to terrestrial ADSL, but if you live far from the exchange, with substandard phone cable, or simply need an internet connection where there’s no phone Tooway delivers the goods. The initial cost is pretty low, the ongoing contracts reasonable, and the performance nothing short of excellent. Turn any electrical outlet into a high-speed network connection With the TM-85 HP you c.. If you are unsure of the best service for your needs, worried that trees could be blocking your s..
Professional Installation by our Tooway trained Installer. 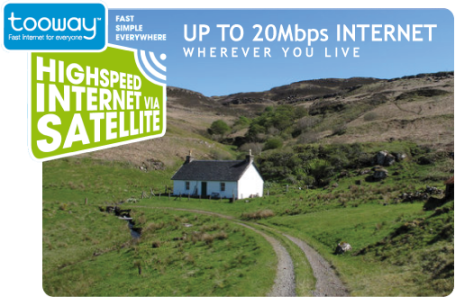 Price includes Heavy Duty South or Eas..
Tooway Broadband Non standard installation. The Tooway satellite dish needs a view of the sky at a compass bearing of 171 degrees, this i..